The ongoing archeological excavations at St. Petri square over the last few years have uncovered the superimposed foundations of three churches (Gothic, Baroque, and Neogothic) that stood here from 1379 to 1960. That year, ruins of the last, neogothic, St. Petri, which had suffered considerable damage in WWII, were finally demolished to make way for a parking lot for Trabbis and Wartburgs. Here, on Berlin’s Fischerinsel, lies the origin of Berlin. A document from 1237 mentioning St.Petri’s priest Symeon is commonly regarded as the city’s historical founding date. Something’s fishy here. Symeon (Simeon, Simon) lived in a town of fishermen, hence the name “Fischerinsel”. Their church was St. Peter’s, aka Simon “the Rock” Peter, first pope, apostle and patron saint of fishermen. Pretty serious stuff, priests, bombs, foundations and archaeological digs. Spirits are immediately lifted from the weight of too much historical reminiscing by this frivolous inflatable, a fourth St. Petri. It’s the marketing campaign of a new online flatshare service, offering symbolic weddings in an inflatable church for Valentine’s Day. And somehow it seems entirely fitting. Now, as an increasing number of us use such services to pimp their artsy rental apartments to small town middle class visitors with mortgages to marvel at our spartan designer shelving and the bohemian lives they seem to support. It could almost serve as a prototype for what is at this point the Stadtschloss’s only viable construction technology just down the alley. New Software enables amazing precision patterning for inflatables that also photograph well. Don’t rule it out. 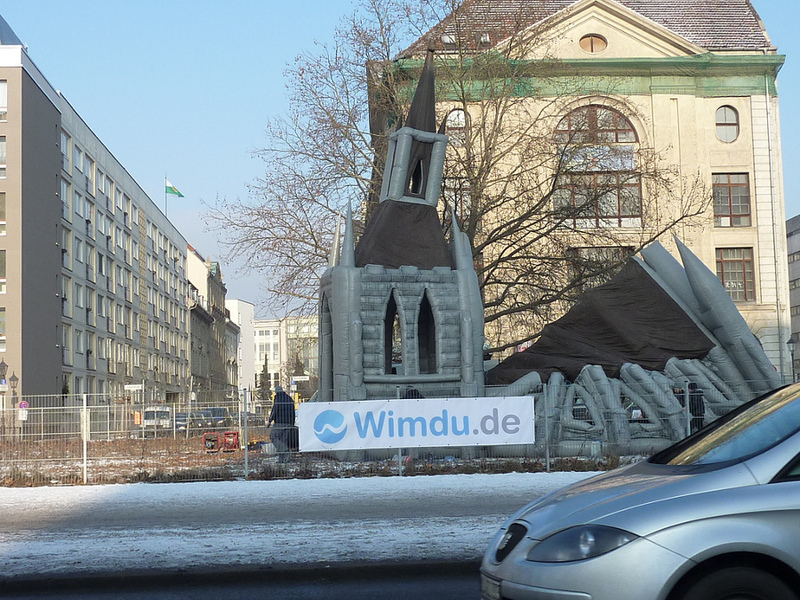 Inflatable Stadtschloss approved by Berlin Senate for 2013 tourist season.